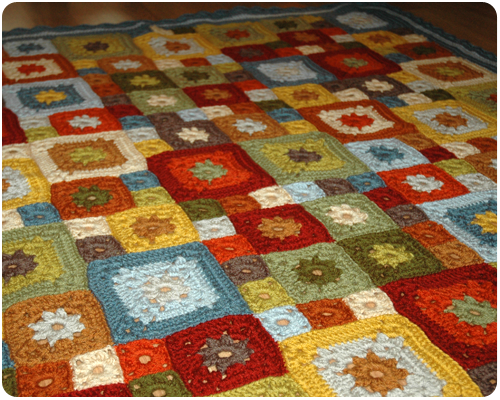 Crafty Cucumber: The Garden Patch Granny Afghan: It's Finished! After almost a year and a half of having this project 'in the works'. After hours and hours of crocheting, blocking, and sewing squares together, my Garden Patch Granny Afghan is FINISHED!!! I am so incredibly proud of this blanket. 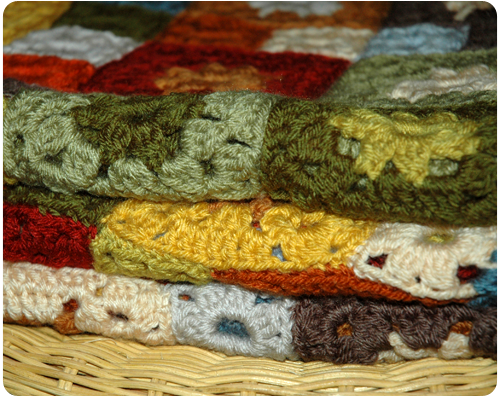 When I made the last stitch and laid my blanket out on the living room floor I had butterflies in my stomach and did a little jump for joy. What a sense of accomplishment I felt. This blanket is truly the greatest crochet project that I have ever done and I love love love it. I loved working on it and I love how it looks all finished. There is something incredibly wonderful about completing a project of any size, but this blanket was such an adventure to work on, such a time investment, that declaring it finished was just amazing. Are you ready to see it in all its granny glory? It really is a sea of granny squares. Like I suspected I would, I have plenty of yarn leftover and have been busy collecting patterns for projects to do with the remainders. The colors coordinate so well with each other and with my home that I am leaning heavily towards a few home decor items. It feels strange to not have this huge project to work on, some next step to get to. But at the same time it is freeing to know that 'the big one' is done and that I can move on to some of the smaller projects waiting in the queue. 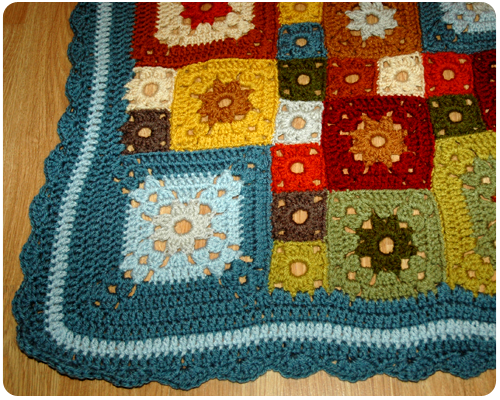 Pity I finished this blanket in the summer when it is way to hot to cuddle underneath it. Oh well, something to look forward to come the fall and winter. Until then, I have it folded on the footstool in the living room, and just looking at it makes me so incredibly happy. Thanks Deb. I am completely in love with my blanket and look forward to wrapping it around myself when the colder weather comes. Beautiful quilt! I love the different sized squares. Nice colors, too! Thanks so much! All the different sized squares is what drew me to this pattern - it's something a little different than the blankets you usually see. Thanks so much for stopping by. 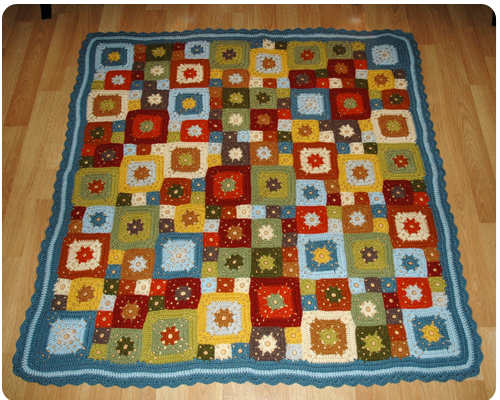 What a gorgeous afghan! That was a mighty accomplishment for sure. Thinking about all the color changes and ends to weave makes my head spin. But apparently so worth it, because come fall you have the perfect blanket to curl up with. Hooray! Oh yes, all the ends to weave in! 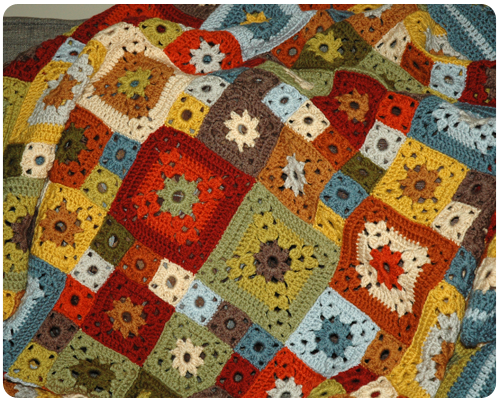 To be honest there were times when I thought I was sewing a blanket rather than crocheting one. But it was so worth it. 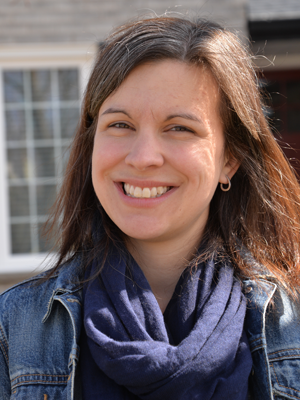 Thanks for stopping by Karen and for your understanding comment. Rachel. That is ABSOLUTELY beautiful. Love the colors and the edging WOW!!! Such a talent. Thank you Leslie. I am in love with this blanket. I can't wait to give this lovely blanket a squish. You have done an amazing job, your blanket is beautiful! Congrats on completing!! Thanks Jill. If anyone knows the amazing feeling you get when you complete a huge project, it is you.